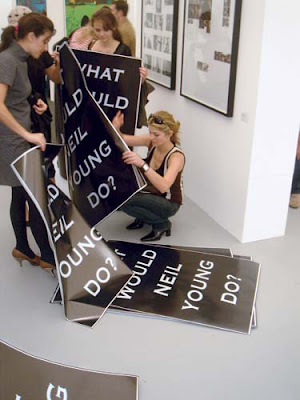 Nothing to Say & Saying It: What Would Neil Young Do? So here it is: Martin Herbert on the singer-songwriter's curious influence on contemporary artists the world over. What would Neil Young do? That’s the punch line of an anecdote in the Canadian musician’s authorized biography, Shakey (2003). Faced with any tricky business decision — whether to do a commercial or a TV show, say — Young and his manager would always ask themselves: "What would Bob Dylan do?" There comes a day, though, when the torch of cantankerous rock-star integrity must pass. Says the manager: "Years later I’m managing Bob, and some decision came up, he turns to me and says..."
"What would Neil Young do?" is also a phrase that a lot of people took away from the Frieze Art Fair in 2006, since it was printed, in large serif caps, on an eponymous give-away poster by the British artist Jeremy Deller — a work designed, he says, to tap the social dynamism of fairs by getting an encouragement of idiosyncrasy out to a big audience. It was perhaps offered up with slightly malicious intent, too, since Deller esteems Young’s happily self-sabotaging tendencies; the man fans call "Neiler" was, after all, surreally sued by Geffen Records in the 1980s for making music not representative of himself (Geffen lost). To that end, Deller confessedly wishes that "lesser talents would do that and then never recover." Regardless, to judge from the decadelong quiet swell of artworks — from practioners as geographically and tactically disparate as Sam Durant, Tim Lee, Melanie Schiff, and Deller himself — referencing or paying sideways or full-on tribute to Young, it’s a phrase increasingly booming in the crania of contemporary artists. Why? Most obviously, Young is a creative type who visibly enjoys — to echo the title of his 1989 album — freedom. Last year he released Chrome Dreams II, a sequel to an album he recorded but didn’t release 30 years ago. "He rocks, he’s a folkie, he did all those bizarre records in the ’80s: punk, rockabilly, techno, heavy metal..." says the LA-based Durant. "He’s pro-gun but in other ways very liberal," adds Lee, a young Vancouver artist who was born in Seoul. "He was anti-Vietnam and a big Reaganite and anti-Bush. You can’t really encapsulate his political ideology. And every album he does seems like a reaction to the last one. And he does sloppy things and perfectionist things." Young publicly changes his mind, yet his very waywardness is consistent. He’s also a living symbol of sorts. Deller, who notes that Young’s "been around a long time, and come to represent the times he’s witnessed," has used the musician as a marker on several occasions, not least in "Marlon Brando, Pocahontas and Me." That curatorial project, for the Aspen Art Museum in 2008, was intended, Deller says, as "a visual representation of a song [Young] wrote." Spinning off from a line from 1978’s delicate ballad "Pocahontas" (referring to buffalo slaughter and Native American rights), Deller’s show ruminated associatively on American history, its embedded brutalities, and its people’s drawn-out divorce from their natural landscape. Accordingly, it moved from ledger-book drawings by Native Americans through ’60s-era photojournalism of Black Panther rallies (featuring Brando campaigning for civil rights) and recent photographs of US military exercises in California’s Mojave Desert. This coupling of Young with compassionate militancy — which his 2006 song Let’s Impeach the President suggests hasn’t paled over time — is what first attracted Durant, who used Young’s music in a body of work he describes as a "constellation of American violence and culture," made between 1997 and 2000. The spur for Upside Down and Backwards, Completely Unburied (1999) was the fact that Young had written Ohio — about the killing of four students by the National Guard during an anti-Vietnam protest at Kent State in 1970 — just shortly after Robert Smithson completed his Partially Buried Woodshed, a structure cracked under tons of mounded dirt, at the same university. Durant’s artwork — which deftly synthesizes the events — is a scale model of Smithson’s sculpture containing three CD players, synchronously and cacophonously spooling out the Rolling Stones’ "Gimme Shelter" (memories of Altamont); Nirvana’s "Smells Like Teen Spirit"; and the Neil Young song "Hey Hey My My (Into the Black)" (which, heartbreakingly for Young, Kurt Cobain quoted in his suicide note) from the 1979 album Rust Never Sleeps. Durant connects that last title to "Smithson’s obsession with rust and decay." Indeed, the whole of Durant’s piece hitches the older artist’s cosmic formalizations of entropy to the specific drift of the US into brutality (and, from this historical vantage, the reversal of its, and Young’s, ’60s ideals), with the musician doubly referenced as both mourner and involuntary chronicler. Tellingly, Rust Never Sleeps seems to be contemporary artists’ Neil Young disc of choice. In 2007, when Lee joined the hidden dots between Young and Steve Martin by taking up the American comedian’s assertion, on his 1977 comedy album Let’s Get Small, that "you can’t play a depressing song on the banjo," it was Rust’s opening track, "My My Hey Hey (Into the Blue),"that he essayed in bluegrass style, the piece ending up as a sound installation and 12-inch single. The gulf between the original acoustic lament and the stormily electrified version of it that closes the album (the one used by Durant) is, for Lee, emblematic of Young’s uneasy, heartfelt transformations during his career (and, to an extent, those of the stand-up comic turned actor turned novelist Martin, too). In a pair of associated photographs named after the two tracks — and emblematizing a practice that’s consciously deflected into emulatory considerations of other practitioners’ approaches — Lee pictures himself lit from above, holding first an acoustic guitar, then an electric, with the long shadows he projects immediately calling to mind the familiar slouch and stance of Young himself. That kind of willed projection, born out of abiding admiration, is taken a stage further in Melanie Schiff’s tender photograph Neil Young, Neil Young (2004). 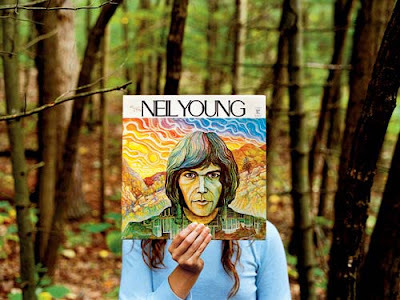 In it, a figure’s head is obscured by the cover of Young’s debut solo album, with its life-size carbon-dated psychedelic portrait of the musician. "It’s about fandom, genius, and awe," says the young Chicago photographer. "He was 23 when he recorded it, and I just found — and find, now that I’m older than that — it incredible that someone of that age can make something so amazing. It was a way of making it my face, because it’s me in the photograph, like a cover song or a tribute or a wish." The line between admiration and analysis is consciously hazed; Schiff, like the other artists I talked to, can happily spiel till sundown about Young, which points to a degree of investitment that exceeds callow referentiality and shades into something greater and more deeply seated. "I don’t think of him as a musician, I think of him as an artist," says Lee. "His work has a conceptual quality to it, and he’s not afraid to experiment and lose fans in the process," says Deller. He has, for Durant, "incredible integrity and authenticity." If you need one more reason why artists might love Neil Young — aside from the fact that the heart-cracking obliquity of "Cowgirl in the Sand" (1969) is more deeply art than almost anything this writer can think of — look at the artworld circa right now. Consider the obvious: the gilded toxicity, the petty snobberies, the encouragement of stylistic conservatism (at least once the lucrative moves have been ascertained) to which so many artists scared of losing status bow down, subconsciously or not. As the market burps out ever more bilious decadence, Young’s holographic presence in contemporary art assumes a ghost-at-the-feast quality: summoned as a scold, he is an exemplar of self-knowledge and audacious bloody-mindedness with few coevals in the artworld itself. "He’s managed to sustain an idiosyncratic career in a horrible business," says Deller, meaningfully. As if to say: if artists are looking to Neil Young, it suggests they’re thinking one thing, urgently, above all: How do I do that? Melanie Schiff, "Neil Young, Neil Young" (2006). C-print, 30 x 40 in. So that was an interesting read. I remember once Bruce Springsteen talking about being jealous of Neil Young, how the Neiler could just flip from a fairly heavy Crazy Horse grunge thing into a rather nice little acoustic thing . . . and I remember being struck at the time that it’s not some magic recipe, it’s not something that’s difficult to figure out, you just do what interests you. That’s the positive side of the Neil Young Icon. There’s also a negative side, where Neil Young just walks away from things and people. His loyalty is to his vision, but his vision is often skewed and could use some assistance. Also, as I was thinking yesterday, there’s almost a complete lack of irony in Neil Young’s vision. I’m not sure what part that plays in allowing him the total freedom to follow any good or bad idea that he has, but I would expect that a lack of irony and a measure of unselfconsciousness are of paramount importance. And he knows some of his ideas are bad. And he rather likes that. Put the good out with the bad, as it’s all one song, is something of his motto. And technical brilliance is a deal breaker. Somehow, technical brilliance smacks of lack of passion and is to be distrusted. Is that a good example of integrity? Possibly. I’m one of those huge fans that has been following Neil Young since the 70s. The first album I purchased was Rust Never Sleeps, perhaps the best example of Neil Young at his best in all the areas of grunge, acoustic, good ideas and bad ideas (“Welfare Mothers Make Better Lovers” anyone?). Neil Young has never won a grammy. He had one Billboard #1 song (“Heart of Gold”). And yet he’s lasted, and his reputation has grown even as he’s produced some of the most uneven albums in rock and roll. I think that’s all part of it as well. He’s somehow achieved great by jumping right over the top of good. His forthcoming album, Fork in the Road is going to be a good example of that, how his openness to any idea is the key to his longevity even as it messes up nearly every one of his albums. I can see why everyone is a little jealous of him. He goes by continuing to go. That potentially says a lot to the way most artists today operate. Neil Young is really, really wealthy. He made a mint back in the early 70s with the massively popular (over time) albums Everybody Knows This Is Nowhere, After the Gold Rush, and Harvest. Most artists these days are not famous and rich. Most artists these days have day jobs, and a large number of those day jobs are teaching. Something about teaching infects us. It makes us creatures that fill out forms. Neil Young does not fill out forms. Such things chip away at that “whatever” attitude he survives by, where, no matter where he is or what he’s doing, if he has an idea, he just wanders away to follow it. Other people fill out forms for him. But there is an important way, I think, that his example still holds for us. As artists, and specifically, as poets, we’re doing something with so little cultural value, it would be really absurd not to do whatever one wants with one’s art. Neil Young as creative icon calls us to throw ourselves at it un-ironically and unselfconsciously, and with passion. To follow every idea, because who knows? You go by continuing to go. That even sounds like fun. I guess I see Neil now as more than just a musician but almost as performance artist. He's transcended music to another level. Neil Young News: A Battle Raged on the Open Page: Can You Change Your Mind? I have that Jeremy Deller poster from the Modern Institute during the Frieze Art Fair and I love it! Jeremy and Neil are the best. I am more than a little jealous. But it also is frightening. neil young would like probably like a nice cup of tea and to sit down and listen to rostrprovich's version of Bach's cello suites... rather than ... X.
X as in the band X? Oh I don't know. He might like both. He seems to be pretty wide-ranging. He's said he's gotten inspiration for his electric guitar style from John Coltrane, for instance. to support a small poetry press or mag? I would be one of the last people to ever call Neil Young a poet. I rather dislike it when people do that about Bob Dylan or Neil Young or Leonard Cohen, or whomever. They write songs. The lyrics without the music are often quite crince-worthy. And I don't know what he does with his millions. The only charitable giving I've ever heard from him is to autism research (he has two autistic children). I know he gives a lot to that. Don't forget Farm Aid, 9/11 and Katrina. He performs/performed at these benefit shows. He founded the Bridge School for severely handicapped kids, and continues to help support it with an annual concert. Why the hate for "Welfare Mothers"? I think it makes perfect sense in the context of the album, which is all about the decay of the hippie dream. And plus, they make better lovers! I don't think of that song very often, one way or the other.